If you don’t have these things, or are unwilling to buy them (materials cost about 100 bucks), you probably shouldn’t try this. 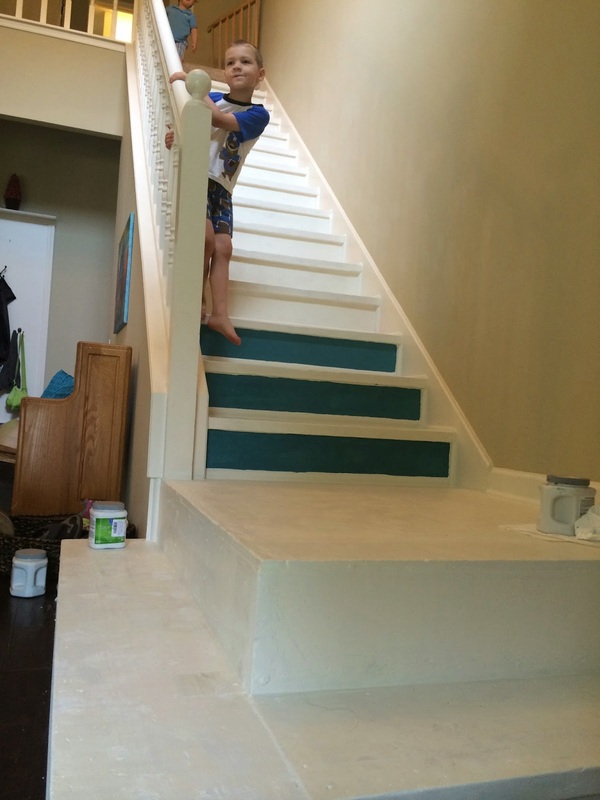 You could use a miter box and sand the stairs by hand, but only if you have a lot fewer stairs. 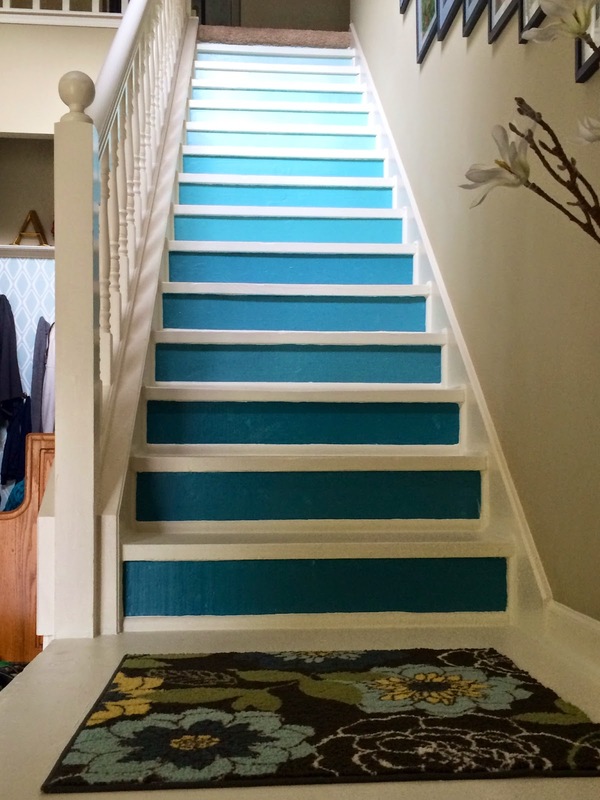 You will hate your stairs and everyone else in your household without power tools. Removing carpet tack strips and carpet stables. This is what the crow bar, hammer, pliers, and screwdriver are for. I hammered the crow bar under the tack strips to remove them–there were three for every stair. Then I pulled out all the carpet staples with the pliers–there were about 30 for every stair. The screw driver came in handy to slide under the head of the staple if they wouldn’t come up. Taking up the carpet, tacks, and staples took an entire day (my kids watched a million hours of TV). Once I got all of the carpet, padding, staples, and tack strips removed, I had very rough looking stairs. They needed a lot of sanding, some wood filler, and trim. There were gaps at the bottom of each stair and along the sides of both the risers and treads. Thus, the need for trim, a miter saw, and caulk. All of these steps took me about four days, but we still lived our lives and fed the children and went swimming and stuff. The stairs were safe to use after the tacks and staples were removed, so it didn’t impede our ability to go up and down the stairs. I did the wood filler at night so it could dry without kid feet getting in it and Jay and I just stepped around it. I am not great with a miter saw and made some wrong cuts, but once I got into the groove of it again, it was not that hard to cut the trim pieces. The kids played outside while I made cuts and then laid the pieces out in place. Once I had all of my cuts made, I glued them down with liquid nails and let them dry overnight. Some of them needed to be taped into place with painter’s tape until the glue dried. The next day I caulked the heck out of every seam on every stair. It took 5 tubes of caulk, my trusty caulk gun, and most of a day. I also mentioned in the materials that I needed to make a lip for the top stair (you can see it in the picture on the left). I cut the carpet a few inches from the top landing and cut the padding out from behind it. Unfortunately for me, there was no overhang on the top stop to staple the carpet to. So I screwed a length of a 1×2 to the face of the top riser and wrapped my carpet around that. I stapled the carpet on the underside and, voila, a carpeted top step. They cost about 5 dollars a piece if you want to try it and I just used the regular paint that comes in sample cans–it was the same satin finish as the floor paint.